It wasn’t immediately clear why North Korea sent some workers back to the office or whether it would restore a full staff. The North’s decision to withdraw its staff on Friday came a week after its vice foreign minister threatened to pull out of nuclear negotiations with the United States following the collapse of a nuclear summit last month between leader Kim Jong Un and President Donald Trump in Vietnam. Seoul’s Unification Ministry, which deals with inter-Korean affairs, said in a statement that four to five North Korean officials showed up for work Monday at the liaison office in the North Korean border town of Kaesong and told South Korean officials they came to work their usual shifts. The ministry said the North had still not provided a clear explanation as to why it withdrew staff from the office. It expressed hope that even the partial return of North Korean personnel would allow the office to serve its “essential function.” The North reportedly had sent about 10 workers each working day to the office since it opened last September as part of a slew of reconciliation steps between the rivals agreed to by Kim and South Korean President Moon Jae-in. “We plan to continue operating the inter-Korean liaison office like we did in normal times,” said Baik Tae-hyun, the ministry’s spokesman. Some analysts say the withdrawal was part of North Korean efforts to pressure South Korea to back its position with the United States more strongly following the breakdown of the Trump-Kim summit. North Korean state media have recently demanded that South Korea distance itself from the United States and resume joint economic projects that have been held back by U.S.-led sanctions against the North. The Koreas in past months have also dismantled some of their front-line guard posts, halted military exercises across their border and vowed to resume inter-Korean economic projects when possible, voicing optimism that international sanctions could end, allowing such projects. While Moon says inter-Korean reconciliation is crucial for achieving progress in nuclear negotiations, the breakdown of the Trump-Kim summit has created a difficult environment to push engagement with the North. Washington and Pyongyang have struggled with the sequencing of North Korea’s nuclear disarmament and the removal of sanctions, and blamed each other for the collapse of last month’s meeting in Hanoi. 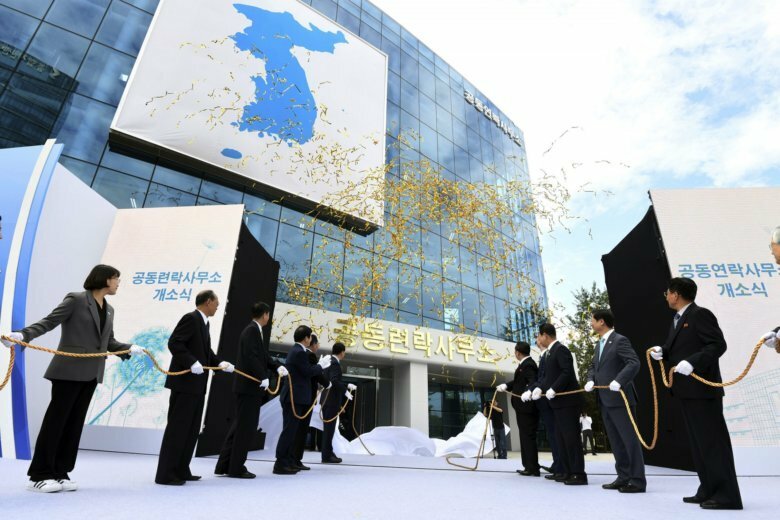 The liaison office between the Koreas is the first since the Korean Peninsula was split into a U.S.-backed capitalistic South and a Soviet-supported socialist North in 1945. The rivals previously used telephone and fax-like communication channels that were often shut down in times of high tensions. Kaesong is also the location of a now-shuttered factory complex that was jointly run by the two Koreas. It combined South Korean capital and technology with cheap North Korean labor. Both Koreas want the United States to allow exemptions from the sanctions to permit the reopening of the factory park, which provided North Korea with much-needed foreign currency. Critics say Kaesong and other inter-Korean economic projects helped North Korea fund its nuclear weapons program.